During November, credit unions picked-up 417,000 in new memberships, loan balances grew at a 9.6 percent seasonally adjusted annualized pace, while savings balances grew 7.1 percent. Firms hired 148,000 workers, nominal consumer spending increased 0.6% and long-term interest rates decreased 1 basis point. Third quarter economic growth was revised up to 3.2 percent and rose 2.3 percent over the last year. At the end of November, CUNA’s monthly estimates reported 5,806 CUs in operation, 9 fewer from one month earlier. Year-over-year, the number of credit unions declined by 248, more than the 221 lost in the 12 months ending in November 2016. Total credit union assets rose 0.5 percent in November, above the 0.3 percent rise reported in November of 2016. Assets rose 6.4 percent during the past year due to a 6.7 percent increase in deposits, and a 7.2 percent increase in capital. The nation’s credit unions increased their loan portfolios by 0.9 percent in November, greater than the 0.8 percent pace reported in November 2016. Loan balances are up 10.7 percent during the last 12 months. 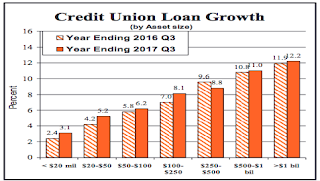 With loan balances growing faster than assets during the last year, the credit union average loan-to-asset ratio reached 69.9 percent up from 67.2 percent in November 2016.
Credit union memberships rose 0.37 percent in November, up from a 0.23 percent gain reported in November 2016. Memberships are up 4.6 percent during the past year due to robust demand for indirect auto credit, solid job growth and comparatively lower fees and loan interest rates versus banks. Credit union loan delinquency rates fell to 0.80 percent in November, down from 0.82 percent one year earlier due to a stronger economy, lower gas prices and double-digit loan growth. 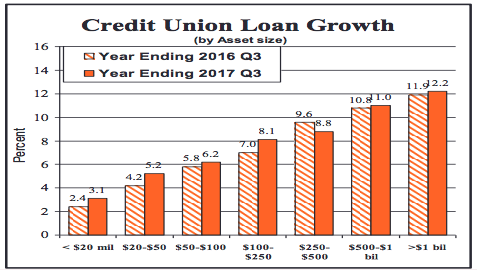 Expect credit unions and banks to loosen credit standards in 2018 to keep loan growth robust. Read the or download the full report by clicking here.